Butcher Box is a new meat subscription service that delivers 100% grass beef directly to your door every month. Each kit includes an array of carefully prepared cuts of meat as if you visited a butcher. Also included are recipe cards for suggestions on how to prepare the various cuts. I recently received a Butcher Box for review purposes. Included in my box were: short ribs, ground beef, bacon, top sirloin and sirloin tips. Altogether each box contains enough meat for 15-20 meals based on 6-8 ounce portions. At $129 per box it seems like a great value to me. 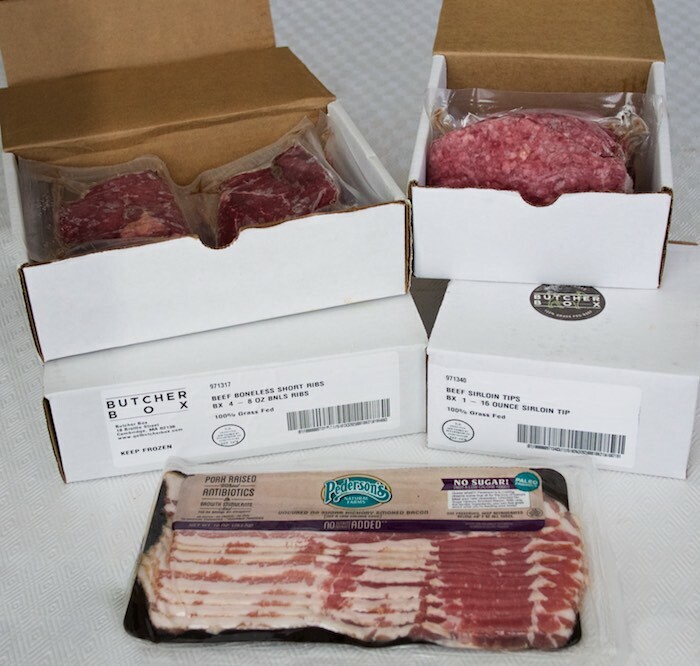 Want to try a Butcher Box for yourself...now's your chance. One lucky reader will have a Butcher Box delivered to them free of charge. Enter the giveaway below! Position a rack in the center of the oven and heat the oven to 325°F. In an 8-quart Dutch oven, heat 2 Tbs. olive oil over medium heat. Season beef short ribs with salt and freshly ground black pepper. Add half of the ribs to the pot (or as many as will fit without overlap), and cook, turning with tongs, until nicely browned on all sides, 3 to 4 minutes per side. Transfer the ribs to a platter and repeat with the remaining ribs. Pour off all but a thin layer of fat from the pan. Add 1 Tbs. olive oil to the pan. Add leeks, celery, fennel and carrots, season with salt and pepper. Cook, stirring and scraping up any browned bits on the bottom of the pan, until the vegetables are soft and lightly browned, 6 to 8 minutes. Add bay leaves, re-hydrated porcini and thyme. Cook, stirring, until fragrant, about 1 minute. Make a spot in the center of the pan and add tomato paste, cooking until fragrant and brownish in color. Transfer all the ribs (and any juices that have accumulated) back into the pot. Combine the rest of the red wine, stock, mushroom soaking liquid and 1 cup of water, and mix well. Pour the liquid over the ribs so that they are submerged as much as possible. Bring the liquid to a simmer, cover, and place in the oven. Cook, turning the ribs with tongs about every 30-35 minutes, until they are fork tender, about 2-3/4 hours. When finished transfer the ribs to a serving platter. Leave the sauce in the pot for a few minutes to cool and with a shallow spoon, skim off as much of the fat as possible from the surface. Season the sauce to taste with salt and pepper, and add 1 to 2 tsp. of red wine vinegar to finish. Serve the ribs on top of polenta with the sauce spooned over. I follow on instagram as rusthawk1. Thanks! I think it's a very convenient service. I like that they sell grass-fed beef and include recipe cards. I think this is a unique idea. There are so many cool ideas out for subscription boxes. I think this is an exceptional concept! I would love to try it out. I follow you on Instagram as royalegacy. I love this concept. I only eat grass-fed beef & would love this! i love this idea! i am always looking for grocery stores with high quality produce AND meats because I find the big box stores are lacking in the freshness and quality that I am primarily looking for! I find this a great idea! I have a toddler and a newborn so it's hard to get out right now! I like the idea of the butcher box, I love the idea of being able to try new things and att a good price . This looks like a great idea from your blog post. High quality meat makes all the difference in a recipe and is worth the extra $$. The Butcher Box would be good for those that include meat for most meals and if you can get that many meals from the box, then the price per serving isn't too bad. I have been looking at this and would love to give it a try! Perfect for our Paleo lifestyle! Whoa. That looks amazing. Butcher box is pretty neat. This sounds delicious! Such a yummy recipe + Butcher Box sounds like a great deal! Ohh YES - that recipe looks fantastic! I love the Butcher Block concept for sure! Would love to win! I follow you on IG too! This work of art screams comfort and flavor, what is not to love?! Of course I follow you on IG! Oh yum! Love the grass fed beef! I love this idea! I need to get in on this! Great giveaway. Oooh, I love the addition of the fennel - these short ribs sound so delicious! I followed you in Insagram and I love the Butcher Box idea. It would help me mix up my menus by trying meats I might not otherwise consider. What a great gift box. I love the recipe you came up with. 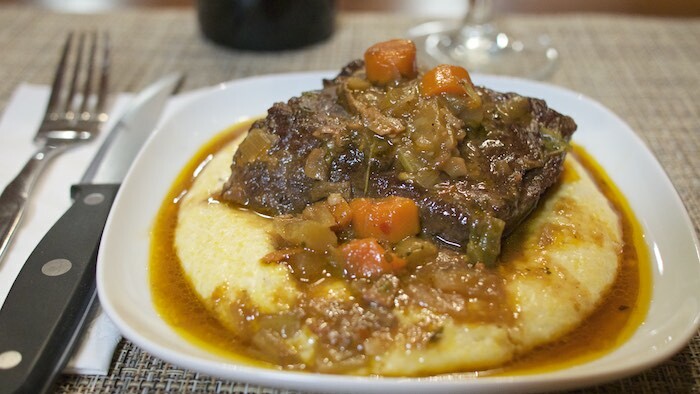 The polenta is perfect to serve the short ribs with. I follow you on instagram. What a great recipe. I love their concept as well. This is the perfect comfort food for this cold weather. Love the idea of have this delivered to your door steps would definitely look in to this. I love the Butcher Box concept, especially if you don't a local farmers market where they sell affordable grassfed beef. Your ribs look fantastic! I need to make some soon. What a fun giveaway and beautiful recipe!! I followed on Instagram as cnebulosus. I think this is a great idea, one less trip to the grocery store is fine with me. This sounds like a great idea! Would love to try! I think it's a great idea, it gets you to try different things and recipes. Looks like a great recipe showcasing great product. I love it! I think it's a fantastic idea. Bith the Butcher Box & the short ribs are awesome! Gimmie a fork!! I follow Food Hunter on Instagram. I will be ordering this!! Truly a great deal! This recipe looks amazing! And I LOVE the concept of the grass-fed butcher box!! I absolutely love it! love the variety and delivered to your door too! Awe nuts! So bummed I missed this giveaway. This would have been the perfect thing to win for my paleo experiment.